Your day starts with an early Chobe Game Drive viewing the majestic wildlife of the Chobe National park. Thereafter it’s time for a short boat cruise to lunch on the ever popular floating Restaurant-The Raft. This eco-friendly restaurant is located in the middle of the Chobe River overlooking the multitude of wildlife inhabiting Sedudu Island. Feast on a traditional African barbeque, salads and dessert and a soft drink or two whilst being enthralled by the amazing sights and sounds around you. 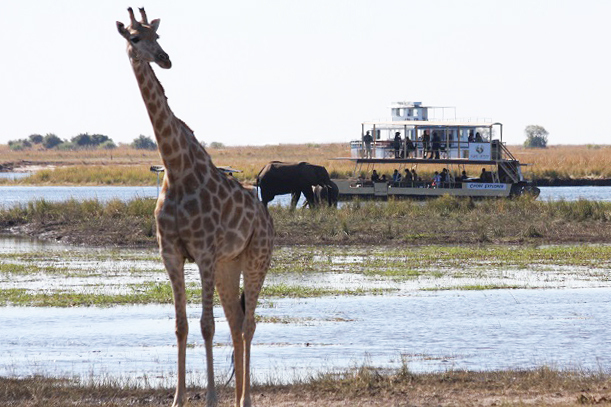 The afternoon continues with a lazy boat ride along the Chobe, where you often feel you could reach out and touch the abundance of animals and birds found at the waters’ edge. Sadly as your day comes to an end, you are returned to your lodge with the wonderful memories of a day well spent. Rate: ZAR 1093,00 includes park fees.